Many forms of combi rigs can present a bait very well, however during our experiments, we found that a few problems can arise when using certain combination of rig materials and presented on certain lake beds. Combination fishing rigs on silt can be an effective bait presentation, but you must use the correct material to disguise the lines. We found that fluorocarbon fishing lines DO NOT look invisible on silt, especially in bright sunlight! How the combi carp rig looks in water and on silt. Black amnesia hidden well on silt, even on a bright day. 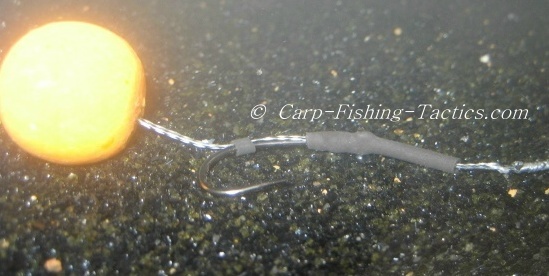 An overhead view of the combi carp rig in silt. 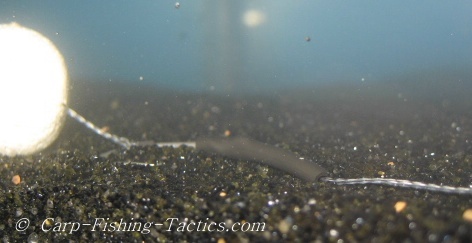 A bright coloured bait really shows up well on silt. Good visible boilies may be needed in order to draw in any passing fish. 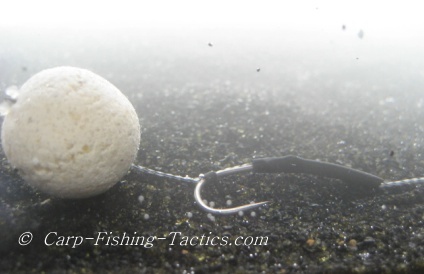 Yes, some carp may spook off bright bait, but this is generally when there's a large mass on the bottom. A single boilie, or even a couple of brightly coloured boilies, won't spook the majority of carp because it's this situation they have learned to associate as safe. When an angler packs up, the bait he threw in will usually disappear gradually until there are only a few scatterings of boilies left in the swim. When a carp feeds on these few baits, it hardly ever gets caught because the angler has gone. The only exception to this is if another anglers jumps straight into the swim after him. In the dark water, the fluorocarbon line is less visible, as is shown in the picture above, but what if the carp can still see it close up? I don't think we should take that risk, do you? I always use black amnesia. 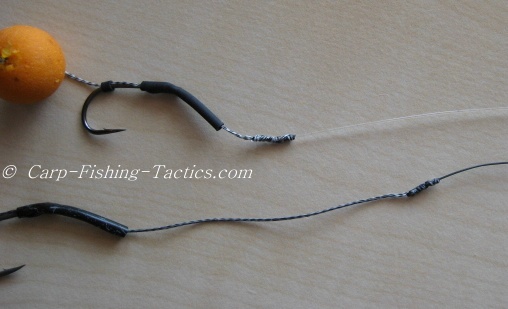 The silt can really help cover up parts of the end tackle, although, remember to use the correct colour for the braid link or it will show up clearly in silt, like in the photo above!